For some reason this picture is one of the most popular pictures on my Flickr page. Of course, being the most popular picture on my Flickr page only requires about 300 views but why should this particular photo keep getting viewed? Am I that cute? Do people love plastic robots? 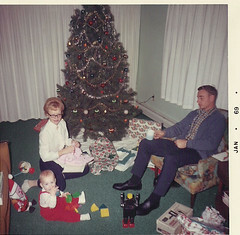 Is it the magic combination of the words Christmas and 1968? Maybe they're using the search phrase "infant dork"